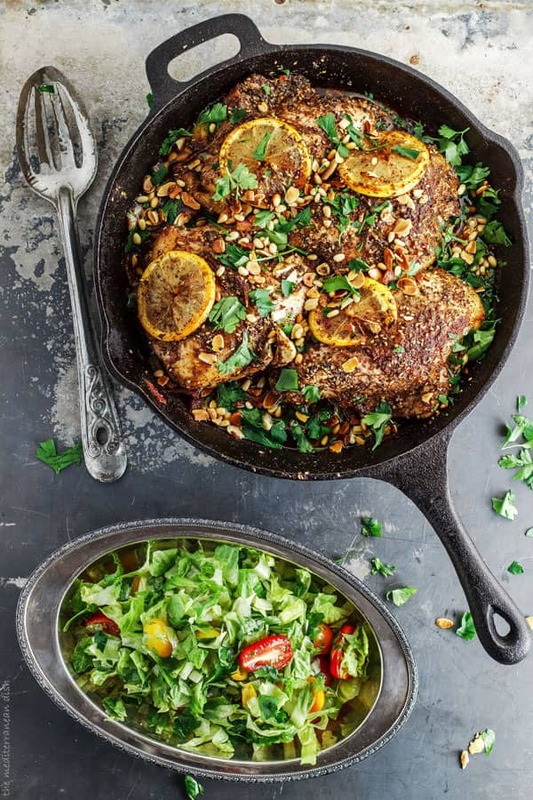 Za’atar Roasted Chicken Breast Recipe…an easy one-skillet chicken dinner that will have your taste buds going crazy (in a good way!) 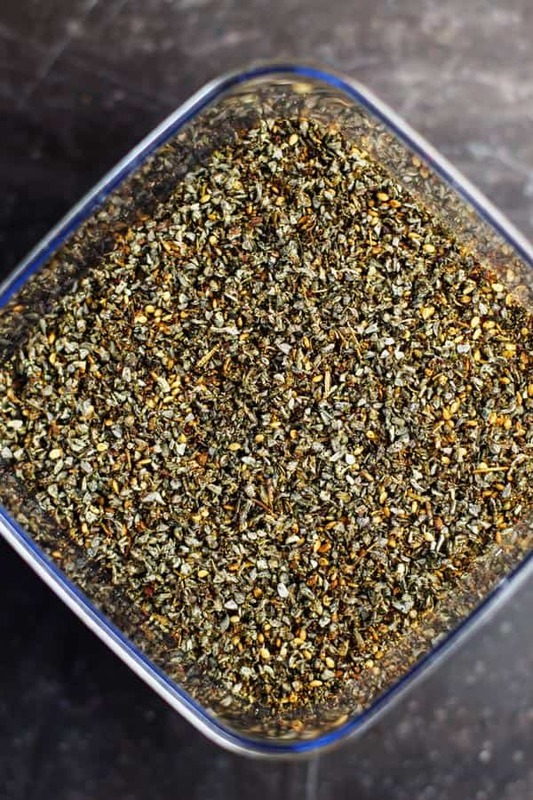 Za’atar is a flavor-packed spice blend of Mediterranean wild thyme and toasted sesame seed. You can find all-natural za’atar spice right here in our online store. 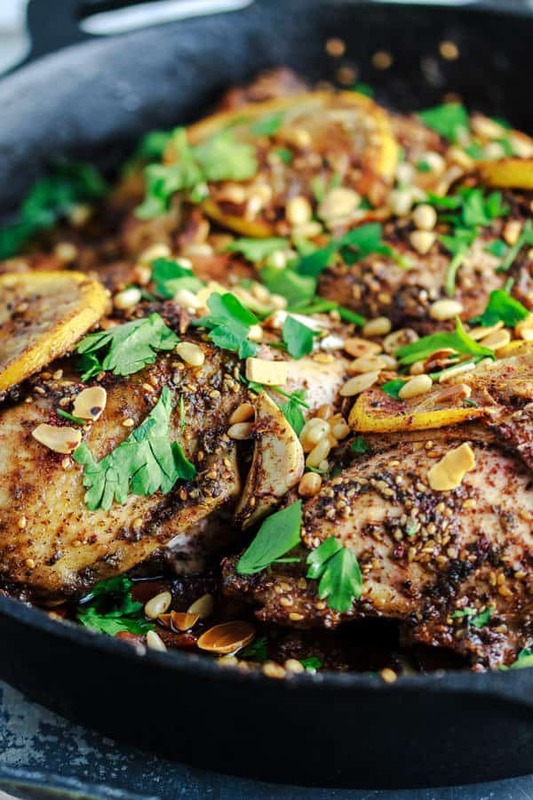 Be sure to check out the step-by-step tutorial for this za’atar chicken! 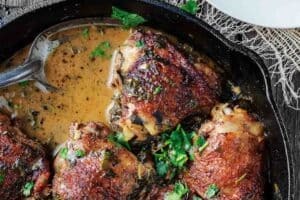 When I posted my recipe for cilantro-lime chicken thighs (another awesome chicken dinner, by the way), a reader wrote to me about her big dilemma involving her husband eating only chicken breast. Well friend, today is your day! But another dilemma that more of us deal with is that roasted chicken breasts are tricky to cook because they often end up on the dry side. 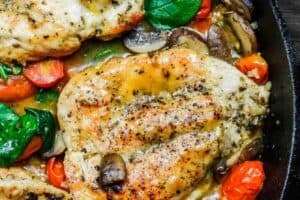 I’ve been experimenting with cooking chicken breasts for a little while now, and I can honestly say, this is one of the best roasted chicken breast recipes you will find. This recipe, adapted from Ottolenghi: The Cookbook, is a spin off a chicken dinner from my childhood. 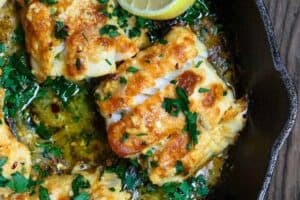 The citrus-based marinade with all sorts of Eastern Mediterranean spices is the key to this recipe’s success. It acts as a tenderizer to the chicken breasts, meanwhile, infusing them with awesome flavor. You are probably more familiar with allspice, sumac and other spices used here. But don’t let za’atar scare you. 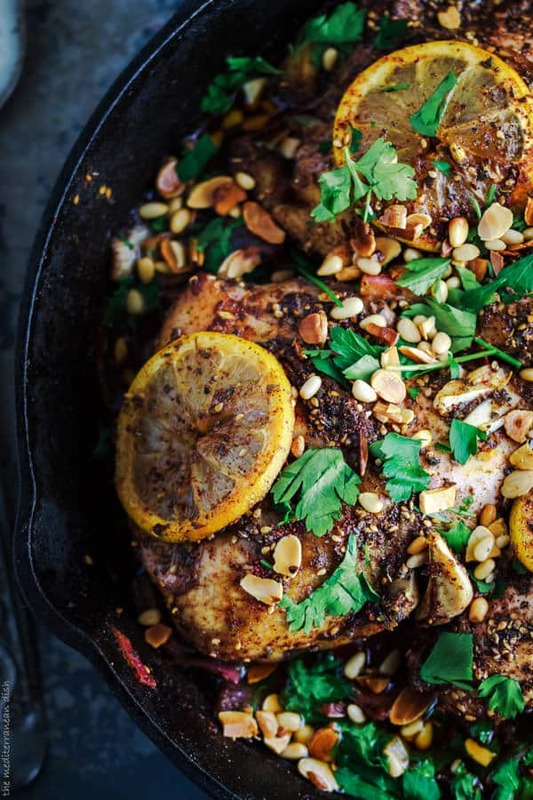 It is an amazing Middle Eastern spice blend that has both earthy and subtle citrus undertones. It often includes spices like marjoram or thyme, oregano, and sumac. And it always includes sesame seeds, which add a nice nutty and woodsy flavor to the spice mix. We all love a roast chicken dinner. After all, it’s quick prep and you can let the oven do the hard work! You will not regret spicing up your roasted chicken breasts this way, though. What to serve it with? Try Israeli couscous salad, or roasted Greek potatoes. In a mixing bowl, combine the marinade ingredients. Place the chicken in a deep dish, sprinkle with salt and pepper and cover with the marinade. To ensure good flavor, work some of the marinade underneath the skin of the chicken breasts. Cover and place the chicken in the fridge for at least four hours or overnight. 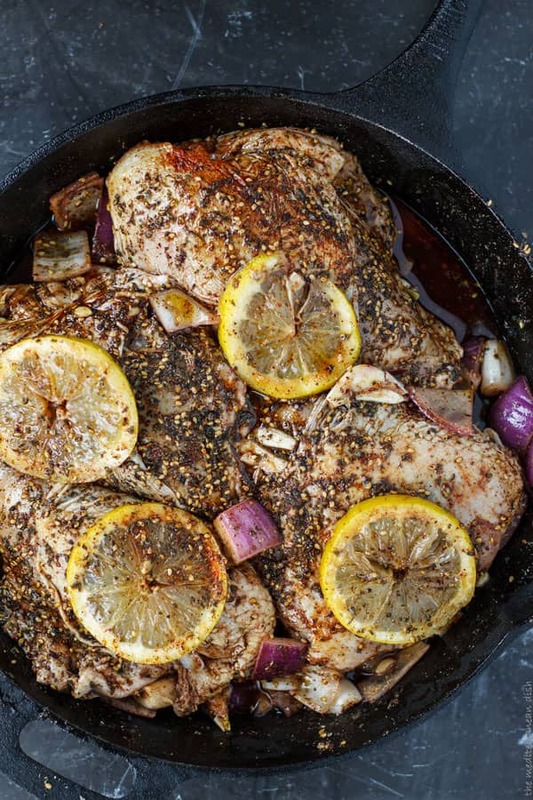 Transfer the chicken breasts and the marinade to a baking dish or a cast iron skillet. Sprinkle with a little more sumac and paprika. Now sprinkle 1 tbsp of the za’atar, and take another tbsp of za’atar to work underneath the skin of chicken breasts. You should have 1 tbsp za’atar left for later. Place the chicken in the 400 degrees F heated-oven; roast for 40-45 mins. Remove from heat, and sprinkle with a little more sumac and the remaining za’atar. Garnish with the toasted nuts and fresh parsley. Enjoy! Best roasted chicken breast recipe you will find! 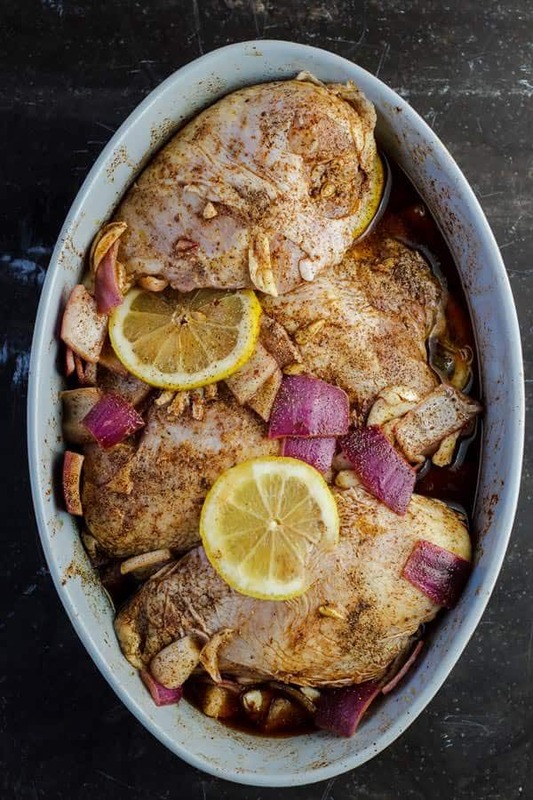 Marinated in lemon and olive oil; flavored with Mediterranean spices like allspice, sumac, paprika and topped with Za’atar. Roasted to fall-off-the-bone perfect. In a mixing bowl, combine the marinade ingredients. Place the chicken in a deep dish, sprinkle with salt and pepper and cover with the marinade. To ensure good flavor, work some of the marinade underneath the skin of the chicken breasts. Cover and place the chicken in the fridge for at least four hours or overnight. SAVE! 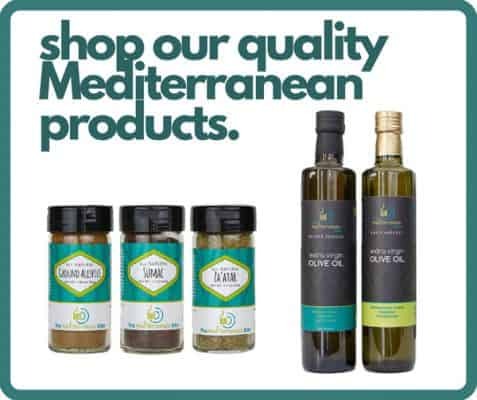 Try our Essential Spice Bundle and the Greek Olive Oil Bundle of two! 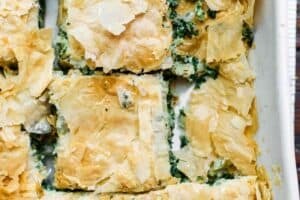 *Recipe inspired by my mom and Ottolenghi:The Cookbook. It was a family hit! My butcher gave me skinless boneless breasts in error but I was determined to go forward. Also, I didn’t clearly read through the recipe in advance so I only marinated for 90 mins. Still juicy, amazing chicken. Will definitely make again. Amazing taste and blend of spices, flavors, and memories of dinners at the mosque. Thank you for this recipe! I’m saving it to my favorites and plan to make this many times in the future! However, it does take more than 15 minutes just to wash and chop produce for this recipe This small complaint is easily forgiven as I sink my fingers into another delicious bit of your chicken. . . . . . Thanks, Jehan! So glad you enjoyed it. 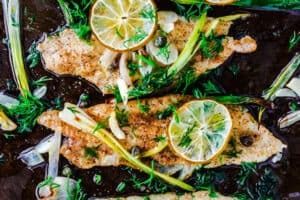 I’m a bit confused as there really is not a lot of washing and preparing produce for this recipe 🙂 But I know prep time varies from one person to another, so thank you for sharing. Fantastic. Moist and Full of flavor. What sides do most serve? I’m clearing up and snacking on oh so tasty morsels of leftover bits… so good! The meat was tender and was brilliantly infused with the lemon and herbs. This was a wonderful meal, but the amount of spice / herb, for us, as presented, was about an 11 out of 10. It hit heavily. I will CERTAINLY make this again. But will back off just a bit on the herbs, so that I can allow my taste buds to be delighted with the marinade and spice. Thank you so much, Keith! This is one of my favorites, and I’m so glad to hear you liked it this much! I accidentally put the zatar in the marinade. So you think this will change the result and taste? Hope not, dinner guests tomorrow! Hi AK. So sorry, when I am on the road, I am not always able to answer questions right then. I hope it turned out okay for you after all. Would love to hear. 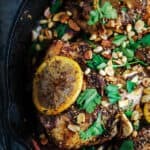 I was just wondering if it was ok to marinate the chicken for so long in lemon juice? I know it can cook the chicken. I have always marinated my chicken for a few hours and up to one night. Just be sure the container in which the chicken is refrigerated is non-reactive. Use a glass bowl or something of that nature, and cover well. This recipe was delicious! I loved how all the flavors came together and the chicken breasts were tender and juicy. Thank you for sharing Teressa! I am so happy you enjoyed it! 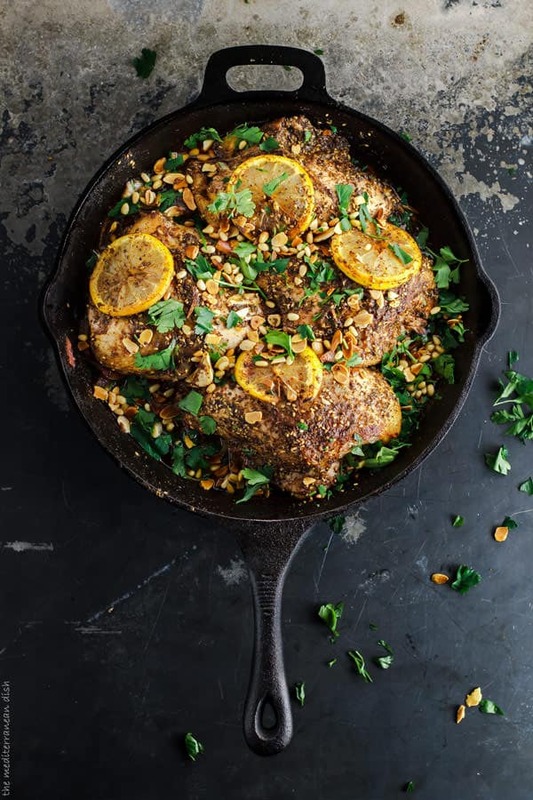 Going to try this with a spatch-cocked whole chicken, roasted in a cast iron skillet. I have a recipe that calls for adding a can of rinsed chickpeas to the skillet at the midpoint. Will let you know how it turns out. Thanks! Charlie, hope you enjoyed it! Would love to hear about the addition of chickpeas! Hi i was wondering… I tend to have dry results from using chic breast. is it possible to use boneless thighs instead? Absolutely, Carol! You may adjust the cooking time a little, but chicken thighs would be great here! I made this dish first to try my za’atar. It was so incredibly good, I had to make it right away again, or listen to my husband’s repeated requests interminably. I ordered Ottolenghi’s cookbook, so fascinated by this cuisine. BTW: I didn’t have sumac, and substituted lemon pepper per internet recommendation. I used air-chilled chicken breasts the first times and marinated for 12 hours and it was SO fabulous. I made it again with a whole chicken and marinated overnight and a half a day and it was not nearly as good. I am trying air chilled again tonight, but I did marinate 2 days. I have used this recipe for only 2 half breasts. It seemed scant for the whole chicken, and maybe that was the problem. Jennifer, thank you so much for sharing! I am so glad you all enjoyed this recipe. And thanks for sharing your variation using whole chicken! Hi there, Oh, everything is just so delicious!!!!! always thought that schools in europe and the usa are on holiday in august, and that the new school year starts in september, anyway wish them well for the new school year. Could you perhaps let me know what to use instead of sumac and zaátar as it is not avialable here in our shops in south africa. many thanks and regards, Rosemary. This was fabulous! The flavor is so good, and it comes together super quickly. This will make it into our regular rotation of dinners. Awesome, Molly! So glad to hear it!